Hi, I am interested in your 1969 Chevrolet Corvette (stock #4671-ATL) listed on Autotrader for $54,995. I'd like to get more information about this vehicle and confirm its availability. Its little wonder that Chevy kept its generation of Vettes around for a full 15 model years. 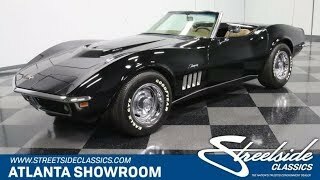 Just take a look at this 1969 Chevrolet Corvette 427 Convertible. Its hard to believe it left the factory some 50 years ago already looking this awesome - it bears as close a resemblance to its concept car inspiration as any production vehicle likely ever has and wears its original colors both inside and out and the appeal of that rumbling big block under the hood is undeniable. Those flowing lines and sweeping front fenders harken back to Chevys Mako Shark II concept car, which wowed audiences at car show expos only a few years before. Its open-air convertible configuration looks great on the model and the Tuxedo Black shade this 69 wears not only mirrors the same color it wore when it debuted, but is also in very solid shape. Its stock appearance remains thoroughly intact - after all, why mess with such a winning look? The assembly of chrome on board - including the front and back bumpers, the windshield trim, the taillight casings and the Stingray script on the front fenders - has a very fresh appearance to suggest it was recently added. Hideaway headlights have been a defining feature for this model for a big portion of its existence and the ones here sit nice and flush in their lowered position and raise into place with no issues. When the skies darken, a new vinyl convertible top stands by for protection. Theres a great looking interior waiting beyond those doors. The bucket seats now wear upgraded leather covers that blend perfectly with their saddle-colored surroundings and sit over an expanse of clean tan carpeting. The door panels were recently replaced and have yet to develop any sign of wear - theres not even a hint of discoloration on their armrests. Just beyond the factory-style steering wheel sitting on its tilt column, the dash area - always a focal point for Corvettes designers over the years - has that distinctive aeronautically inspired look the model became known for. The dual displays in the instrument cluster, as well as the additional gauges at the center of the dash, are all nice and clear and function as intended. A straight, supple-looking dash pad runs across the top - always a welcome find in a classic convertible like this - and an aftermarket AM/FM/CD player has been added to handle audio duties, assisted by a pair of speakers behind the seats. The engine compartment on this classic is looking sharp and is filled by the 427 cubic inch V8 - the largest displacement engine offered at the time. It wears its proper Winters aluminum intake manifold, chrome air cleaner and valve covers and featured a full 390 horsepower when it first left the factory. The engine was recently rebuilt, with both receipts and a spec sheet to back up the work performed. Its logged only a little more than 2500 miles since it returned to the asphalt, so its just now broken in and pairs with an also original 4-speed manual transmission. A pair of period-correct chrome headers keep back pressure to a minimum while the aluminum radiator up front ensures operating temperatures remain in check. Youll find disc brakes at all four corners to provide prompt, fade-resistant stops and, in an era when leaf springs were still the norm, this Vette sports an independent rear suspension that was light years ahead of the competition. 15 stock Corvette wheels wrapped with beefy Goodyear Eagle GTII tires complete the look of this head-turning classic. This 1969 Chevrolet Corvette 427 Convertible offers an unbeatable combination of originality and open air driving exhilaration. Call today!